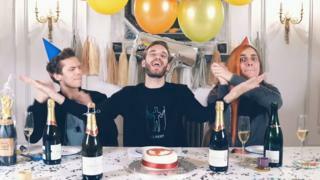 Swedish gamer and video-maker PewDiePie lost his crown as the YouTube star with the most subscribers. For a day he was in second place, behind Indian channel T-Series. "All it took was a massive corporate entity with every song in Bollywood," he sings in the video, referring to his defeat. On Monday morning, T-Series was about 15,500 subscribers ahead of PewDiePie, who has more than 92 million subscribers. However by the afternoon PewDiePie was back in the lead, with 34,400 more subscribers than T Series. In recent months, PewDiePie's supporters had carried out a number of promotional efforts on his behalf. fellow YouTuber Jimmy "MrBeast" Donaldson and friends wearing PewDiePie T-shirts at the US Super Bowl. A pair of fans hacked thousands of printers that then printed out messages telling people to subscribe to PewDiePie's channel. PewDiePie's subscriber count was boosted when Tesla chief Elon Musk co-hosted an edition of his Meme Review show alongside Justin Roiland, the co-creator of cartoon series Rick and Morty. T-Series owner Bhushan Kumar recently told BBC News that he did not view his channel as being in competition with Mr Kjellberg's . "I am really not bothered about this race. I don't even know why PewDiePie is taking this so seriously," he told India correspondent Soutik Biswas. T-Series was started by Mr Kumar's father as a production company in 1983. The company recorded devotional music and sold the tracks on cassette. It put its first video on YouTube in 2011. Mr Kjellberg launched PewDiePie eight years ago and went on to become the world's highest-paid YouTuber. Despite his success, the most subscribed-to channel on YouTube remains one of the platform's own. Its music videos channel has more than 105 million followers. Video The PewDiePie Hackers: Could hacking printers ruin your life?